Along with his partner Olaf Stenson, Michael Pastoret built the Pastoret-Stenson Block, yet another Traphagen-designed Richardsonian Romanesque building faced with brownstone quarried in Fond du Lac. The six-story building featured a rounded corner with a carved entrance where Superior Street meets First Avenue East. Plaques carved with “O. Stenson” and “M. Pastoret” sat above columns on either side of the entrance. Arched windows on the top floor along with carved stone bands of scrolls and leaves between floors added to the building’s visual appeal. 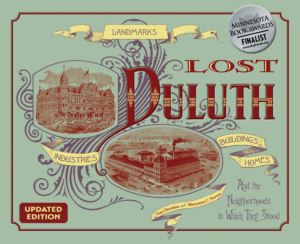 First used to house Michael Pastoret and Olaf Stenson’s dry goods store, the building was later rented to a number of businesses over the years: an undertaker, Singer Sewing Machines, Gotkins Greater Markets, the B & Y Cap Company, King Korn Stamps, the Duluth Sewing Center, and even a Radio Shack. The third through sixth floors were converted into apartments, and the building’s name was changed to the Lowell Block. In 1930 a fire that started in the B & Y Cap Company spread to the top floors where two adults and two children were trapped — and died. America was still under Prohibition, and rumors circulated that the fire was caused by a still operating in the cap factory. Only the bottom three floors were saved. The building’s last residents were John’s Used Furniture and the Last Place on Earth. In 1999 the building was demolished and replaced with another whose first three floors attempt to replicate those of the original.